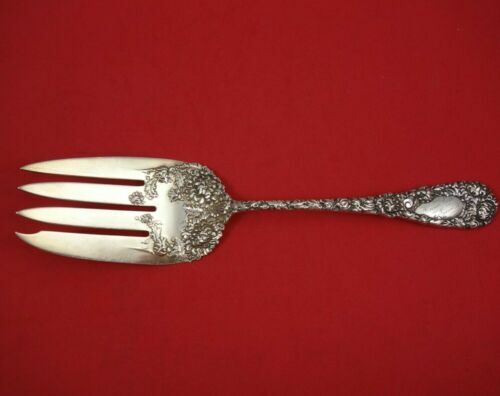 $10.5 (4 bids) Tiffany & Co. Sterling Silver Fork Chrysanthemum Pattern 7 1/4"
Buy: $65.0 TIFFANY & CO. 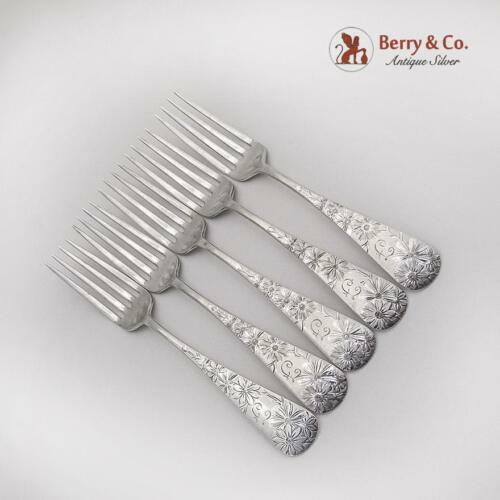 CHRYSANTHEMUM STERLING SILVER BUTTER KNIFE. NO MONOGRAM! 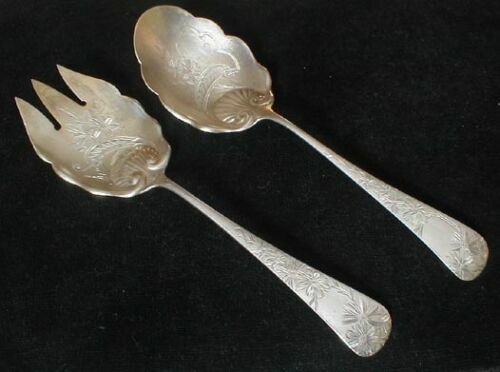 Buy: $145.0 TIFFANY CHRYSANTHEMUM GUMBO SPOON(S) ~ 7 3/4"
Buy: $325.0 TIFFANY CHRYSANTHEMUM SUGAR SIFTER ~ 5 3/4"
$259.0 Chrysanthemum by Tiffany and Co Sterling Silver Steak Knife Original 9 3/8"
Buy: $115.0 TIFFANY CHRYSANTHEMUM DESSERT FORK~ 6 1/8"
Buy: $190.0 TIFFANY CHRYSANTHEMUM PIERCED OLIVE FORK~ 6 7/8"
Buy: $235.0 TIFFANY CHRYSANTHEMUM PIERCED OLIVE SPOON ~ 6 5/8"
$209.0 Chrysanthemum by Tiffany and Co Sterling Silver Fish Knife HH WS Original 7 3/4"
$168.0 Antique DURGIN Sterling Silver CHRYSANTHEMUM Fork - No Mono - 7 3/8"
$289.0 Chrysanthemum by Gorham Sterling Silver Berry Spoon Brite Cut Bowl 9 1/8"
$189.0 Chrysanthemum by Tiffany and Co Sterling Silver Place Soup Spoon 6 7/8"
$489.0 Chrysanthemum by Tiffany and Co. Sterling Silver Roast Holder 10"
Buy: $450.0 TIFFANY LAP OVER EDGE "CRANBERRY" CHEESE SCOOP ~ 7 1/4 "
$189.0 Chrysanthemum by Tiffany and Co Sterling Silver Pate Knife Original 5 1/4"
Buy: $299.99 Gorham Imperial Chrysanthemum Sterling Silver Salad Serving Set - 8 1/2"
Buy: $465.0 12 Pcs Old ALVIN MAJESTIC STERLING 6~ DINNER FORKS 7.5" & 6~ DINNER KNIVES 9.75"
$489.0 Chrysanthemum by Tiffany and Co Sterling Silver Master Butter FH 8 5/8"
$289.0 Chrysanthemum by Tiffany and Co. Sterling Silver Salad Fork w/ Beveled Edge 6"
$389.0 Chrysanthemum by Tiffany and Co. Sterling Silver Master Butter Knife FH 7 1/4"
$389.0 Chrysanthemum by Tiffany & Co. Sterling Silver Gumbo Soup Spoon 7 3/4"
$309.0 Chrysanthemum by Durgin Sterling Silver Cold Meat Fork with Design 9 1/4"